Women Veterans Program – provides comprehensive health care for women Veterans offering primary care, to include gender specific primary care, at every site by a proficient women’s health provider. The female Veteran population will increase in the near future due to the higher percentage of women enrolled in the current conflicts. 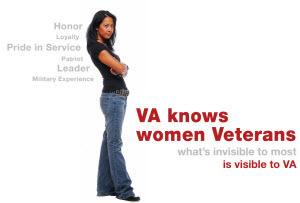 Currently there are over 3,000 female Veterans enrolled at the Martinsburg VA Medical Center. 1,250 women choose to receive their care at their local community based outpatient clinic (CBOC) with the remaining electing to receive care at the medical center. All Veterans seen in the CBOCs have the option of having their Pap smears and breast exams completed by designated women’s provider (DWP) located at their CBOC. We currently have a DWP at each site who provides gender specific primary care. Improving screening rates for breast and cervical cancer through tracking tools, follow up phone calls to patients, and follow-up with providers. Women’s Comprehensive Health Implementation and Planning Team working to assess and address female Veterans' projected health care needs over the next 10 years. We continue to work with the Public Affairs Office and partner with other departments who provide outreach to ensure women Veterans are aware of the services available to them. Working with community partners to provide additional resources to our women Veterans.